We've all heard the saying... Today I whipped up a meal I had been dreaming about for months. An ultimate hunter/gather's meal if you will. Just for the record I will tell you, I am a huge fan of gathering food from the wild and making meals out of it. Trout, berries and mushrooms are my favorite. Recently I discovered the magic of dandelions and how they make really good pesto and go great in salads, and one day, maybe early this summer I will make dandelion wine. When they pop up again I will try out sauteing wild onions into a meal. I love to grow my own produce, but the mountain climate I reside in just isn't conducive of growing much, so I resort to what nature gives me. This ultimate meal is very simple and consists entirely of items I hunted and gathered. I consider myself an avid fisher woman. My parents taught me very early on the splendor of reeling in a powerful, feisty Colorado trout. My tasted buds turned out to be very fond of them too! Throughout the years and wisdom gained, I learned what it meant to take only what you need and leave the rest to prosper for generations to come. I am a big supporter of "catch and release" fishing, but every now and then I get hungry. I love to head down to the river in the morning and pull out that evening's dinner. And out of necessity, every now and then I will do a little stocking up for winter to get me buy when there are just no fish to be found. 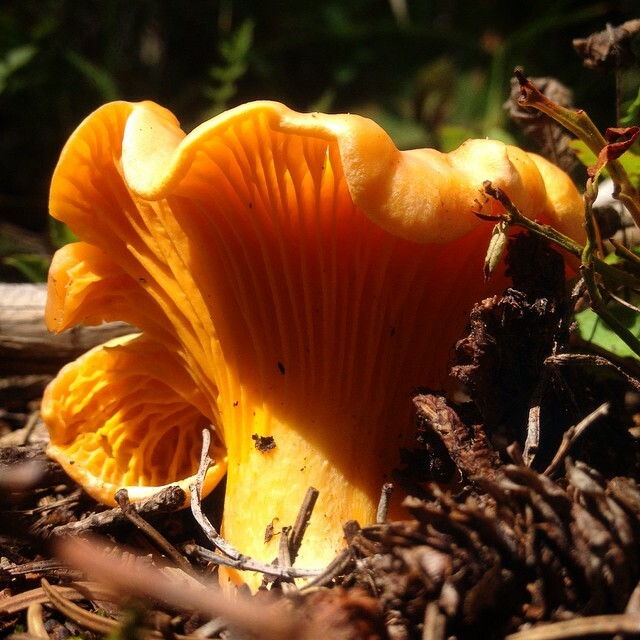 I've spent the past two summers hunting down the infamous Chantrelle (Cantharellus Cibarius) mushroom here in Colorado's San Juan Mountains. Last season I found them. I indulged myself for as long as the weather allowed me to hunt and find them. Knowing how precious these scrumptious, little golden mushrooms are, I had to save a few bundles for later cravings. I quickly sauteed them in butter, threw them in a Ziplock and hid them away in the freezer. Last spring I was introduced to something I had always wanted to find where I lived last. Something that is known to grow along the ditches and canals of the Grand Valley around Grand Junction, CO. Alas, I learned it also grows many other places in western Colorado as well. 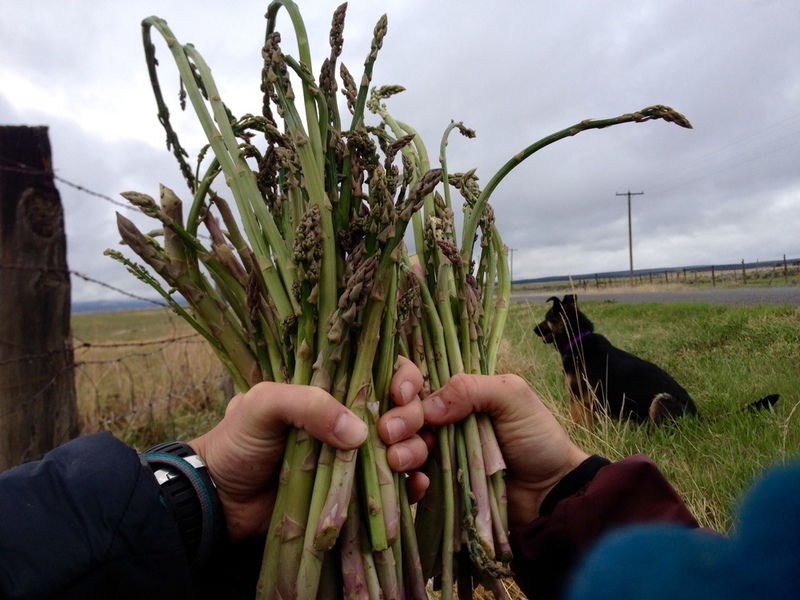 Wild asparagus is known by many in southwest Colorado to grow along the roads and ditches around Norwood, Colorado. I was taught last year what to look for and where and I came away with a decent bundle for dinner. I took that bundle of freshly picked wild asparagus with me on a camping trip in Moab, UT, sprinkled a little salt and pepper on it and grilled it over a desert campfire. That was the first time I had tasted wild asparagus and I couldn't believe how tender and sweet it was. From that point on, the store bought stuff just doesn't cut it. This year, we timed it a few weeks earlier. So early in fact, It had just snowed a bit and I was unsure if the plants would have survived. Yesterday we went for a little drive down the valley to Wright's Mesa and goodness gracious all mighty, we hit the motherload. We found way more than we could ever eat and it wasn't going to stop! We took enough for a couple meals over the next week and headed home. On to my dream meal. I love trout and asparagus! I think as far as adding some greens to trout, that "gutter grass" is just about the best compliment one can indulge in. I don't know exactly why the idea came to me, probably because I so badly wanted spring to get here. One day, knowing I had just one last baggy of chantrelles in the freezer, I said once the asparagus pop up again, I am going to make a meal of fresh caught trout covered in chantrelle mushrooms with asparagus sprigs on the side. Not only that, I am going to grill the entire meal. I used a little sea salt, pepper and olive oil to season the asparagus and threw a little of the same on the trout as well as in the fishes cavity, I stuck a sprig of rosemary I had growing in a pot indoors. The chantrelles, I simply thawed and re-sauteed/grilled them in a little more butter on some aluminum foil next to the asparagus and trout. Low and behold, chantrelles are incredible paired with trout and wild asparagus! Something about grilling the mushrooms brought out more of their natural nutty flavor and kicked their sweetness up a notch. And I can't get enough of the tender sweetness of grilled wild asparagus. Fresh grilled trout is just so simplistic in flavor, especially paired with a little fresh rosemary or lemon thyme!That was by far one of the best meal pairing ideas I have ever had, and yes it was my own. No Pinterest here! It's too bad mushroom season and asparagus season are so far apart, there is no way to have them both freshly picked in the same day. At least we have the trusty trout to rely on, available just about all season long! Give a woman a fish and you feed her for a day; teach a woman to fish and you feed her for a lifetime.